Currently the ministry, with the help of the transition battalion chaplain, organizes and hosts five types of outings-R&R weekends, Retreats, Day Events and Couples in Crisis. These events are held from September through May. We also continue to teach Card Making twice a month year round. *R&R Weekend-Guests arrive in Fredericksburg Friday afternoon, check into their housing and meet for dinner and fellowship. They are provided with information about what’s going on in Fredericksburg and the surrounding area that weekend. Everyone receives “Goodie Bags” full of snacks, a devotional, tickets to the Nimitz Museum and Fritztown Cinema. Those staying at cabins also receive their breakfast items (only the hotels provide breakfast). Guests are on their own to do as they please until lunch and later, dinner at a church Saturday evening. Some guests attend local churches Sunday prior to returning home. *Retreats-These are over a weekend also but more structured as the chaplain holds classes focused on recognizing potential problems and how to avoid them, communication, etc. All meals are provided during a retreat. In addition, there is usually entertainment Saturday evening and drawings for gifts. Sunday morning the chaplain holds an optional worship service. 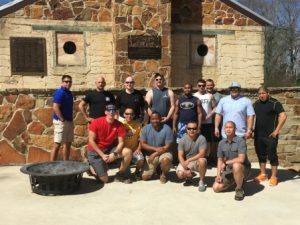 *Day Events-A day event can be anything from a fishing tournament to a day at the spa or hiking Enchanted Rock. These events are designed to meet specific needs as they are identified, i.e., a spa day for care providers who need to be pampered for a change. *Card Making-WWAN team members travel to the Warrior Family Support Center (WFSC) on the first and third Tuesday of each month and teach card making. A home made dessert is served by the team after class providing a good forum to build relationships with the warriors and/or spouses. Team members also pass home made cookies out to everyone in the WFSC. *Couples in Crisis-There are times when a warrior or spouse is so stressed they are reaching their breaking point. When the Command or Chaplain recognizes this situation and counseling, etc. have not helped they call WWAN, explain the situation and the Ministry arranges an expense paid weekend getaway in Fredericksburg. This allows the couple the opportunity to decompress in a stress free environment and focus on each other for a change.